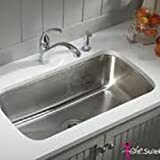 Top 10 Best Kitchen Sinks in India 2019 - Top 10 In India - Only The Best of everything! 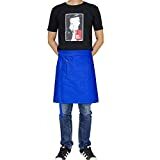 LATEST product list, updates regularly! 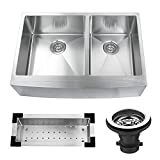 Thinking of installing a new kitchen sink? Whether it is for a new kitchen or part of a remodeling project, the kitchen sink is of paramount importance. 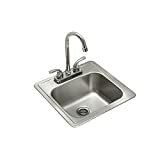 The kitchen sink along with the refrigerator and the stove form the three crucial foundations of a kitchen triangle, and its placement is very important. A kitchen may be L shaped, U shaped, in a straight line or with two counters. 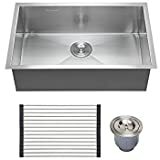 In each of these arrangements, the kitchen sink should be placed away from electrical outlets, in a bright airy part of the kitchen, facing a window if possible. 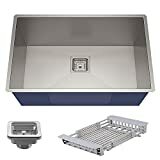 Along with the kitchen sink, accessories for the sink are also important – draining board, choke stop strainer, faucet, vegetable bowls, liquid soap dispenser and waste coupling. 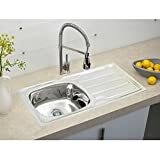 A good kitchen sink that is sized perfectly for your kitchen and that goes with the look of the kitchen is not only essential, it also adds to the classy good looks of your kitchen. 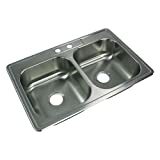 A kitchen sink is something that gets fixed into the kitchen counter right when it is being made. Ideally you need to choose it right at the time when you are building your home. 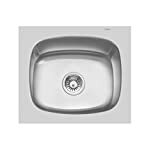 However sometimes due to the sink being many years old or the style becoming outdated, you may want to purchase a new kitchen sink. That is where a list of the Top 10 Bestselling Kitchen sinks in India comes in really handy. Just have a look at these universal bestsellers, which have been purchased by thousands and thousands of India. 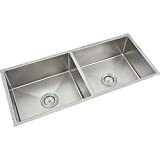 Go ahead, choose choose a kitchen sink that will deliver convenience and quality for may many years.. 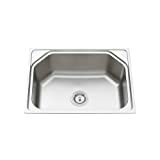 Depending on your budget and requirement, you can choose from a variety of materials for your kitchen sink. Each have their plus points in terms of functionality, looks and aesthetics. Here are five such different types of kitchen sinks. This is the most popular of kitchen sinks. 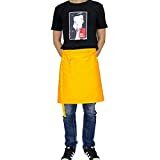 It is a tough and durable option, easy to clean. It is inexpensive though designer brands may cost significantly more. Stainless steel is measured in gauge – a heavier gauge may be less prone to dents. 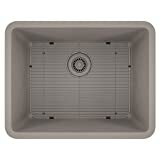 Do remember that stainless steel sinks tend to be quite noisy, though a spray coating or padding can take care of it. While these sinks are resistant to chipping and cracking, they do tend to get scratched quite easily. 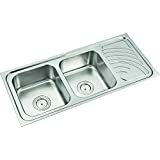 Choose from the bestselling stainless steel kitchen sinks here. 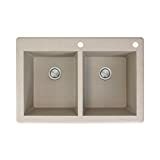 Porcelain coated cast iron kitchen sinks are extremely durable apart from being very good looking. They are available in a variety of colors and are very quiet. However, because of the cast iron and the porcelain, these sinks are rather heavy and difficult to install. 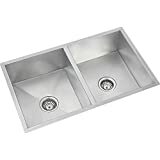 They can also be much more expensive than stainless steel sinks. Even though coated with porcelain, they are extremely tough and there is little fear of the porcelain cracking or chipping. They are very easy to keep clean with their glossy, non-porous smooth finish. 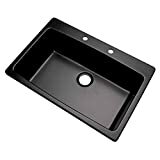 Choose from the bestselling cast iron kitchen sinks here. 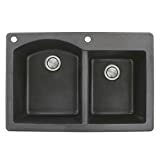 Composite Sinks are made by combining crushed stone (granite* or quartz) with a resin filler usually in the ratio of 80 is to 20. This makes such sinks incredibly touch and resistant to wear and tear. 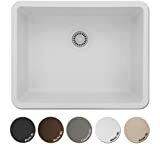 They come in a variety of colors and any minor micks or scratches can be remedied with epoxy filler matched to the exact shade of the sink. They are easy to install and do not add to the noise levels when in use. They might just be the toughest sinks available in the market today. 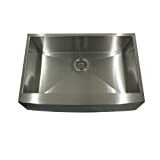 Choose from the bestselling composite kitchen sinks here. 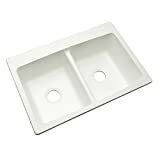 Choose from the bestselling solid surface kitchen sinks here. * The term “granite kitchen sinks” is used interchangeably with “composite granite kitchen sinks”. Such sinks do not have quartz as a component. 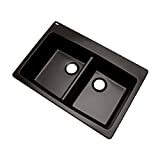 Choose from the bestselling composite granite kitchen sinks here. 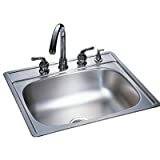 Now that you have decided on the material of your new kitchen sink, let us focus on the type of sink you need. Here are the various options available for you. 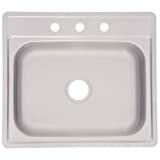 These are single basin sinks, that can comfortably allow washing up of large pots, trays and cookers. 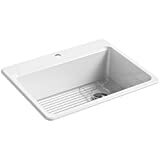 They are easy to clean and are most economical of sinks available in a particular material. They are very compact and can be installed even into a corner, ideal for small homes. 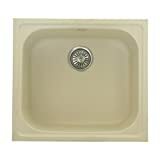 Choose from the bestselling single bowl kitchen sinks here. These sinks offer a lot of flexibility in terms of washing up and draining. The two bowls can be of varying size, depending on your requirement. If you anticipate a busy kitchen, do take care that the two bowls are large enough to accommodate your requirements. 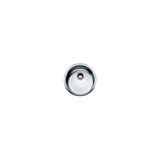 A swivel faucet or a double barreled one can be installed over such a sink. 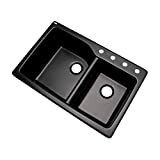 Choose from the bestselling double bowl kitchen sinks here. 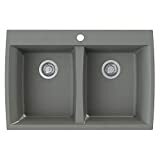 Very easy and inexpensive to install, top mount sinks simply drop into a hole in the counter, with a rim to hold it in place and give a finished look. There is no need for an internal support system. This is however an old fashioned sink, and there is a likelihood to dirt and grease accumulating under the rim. 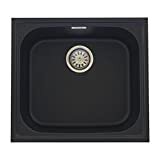 Choose from the bestselling top mount kitchen sinks here. 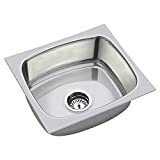 Such a sink is mounted under the counter, with no lip or rim, with the edge of the counter dropping off into the sink directly. This is a modern sink, with clean and clear lines. There are no grooves for food and dirt to accumulate, making cleaning up easy. 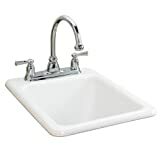 However, these sinks are more expensive than top mount sinks and installation requires expertise. 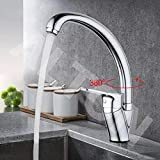 Do remember that these sinks are not designed for faucets or attachments, and the holes for them will have to cut in to the counter as per the customization. 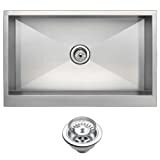 Choose from the bestselling under mount kitchen sinks here. 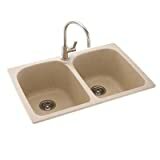 Also called a farmhouse sink, these sinks are extremely stylish and hark back to a traditional, country-style design. Here, the forward facing part of the sink is visible and replaces part of the counter. Available in both single bowl and double bowl variants, they are not easy to install and are usually expensive. In most cases, the counter has to be customized to accommodate an apron front sink. 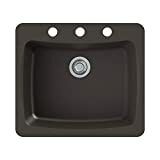 Choose from the bestselling apron front kitchen sinks here. 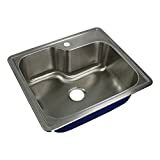 When you buy a kitchen sink, you will also need a counter top to go with it. Choosing a counter top can be time-consuming and also a costly affair. In addition, people are always talking about the advantages and disadvantages of counter tops. This article will help to know about the advantages and disadvantages of counter tops made of composite, plastic, granite (stone) and even wood and concrete. Counter tops made of granite are nice but pricey. In addition, they ask for care and careful handling as they can get permanently damaged. A composite counter top is composed of various materials and is not a 100% natural product. As a result, the composite counter top is slightly cheaper than a granite one. However, you have to be careful with hot pans and corrosive materials! Concrete counter tops are the future. 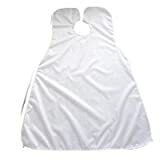 The sheets are trendy and can be easily made. In addition, they are really strong and hard. The drawback is that they are heavy and porous. Counter tops made of plastic are popular because they are inexpensive and durable. In addition, you can easily assemble. On the other hand a plastic worktop is sensitive to heat and moisture. The ceramic counter top is the latest addition to counter tops. These ceramic counter tops have been welcomed with great enthusiasm by both kitchen specialists and consumers. This is due to the many advantageous properties of the ceramics sheets. 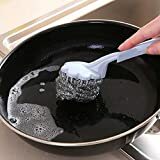 "BOWL SIZE: 40 cm x 34 cm x 15 cm "
"202 GRADE STAINLESS STEEL, 1.0 MM THICKNESS "
"CHOKE-FREE STRAINER, SCRATCH GUARD TO PROTECT DURING INSTALLATION, ANTI-FUNGAL COATING IN BOTTOM, SOUND DEADENING PAD IN BOTTOM "
Ceramic disc cartridge can survive 500,000 times open and close test ensures longevity, single hole deck mount, two 24 hoses Indian standard size and mounting hardware included. 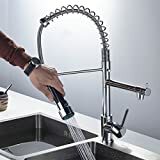 Aerator bubble water outlet, convenient for family using Brand ceramic disc valve, provides a lifetime of smooth and drip-free. 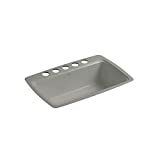 Basin depth of 9 in. 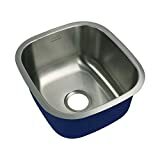 Basin depth of 8 in. 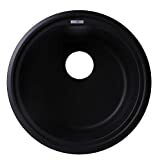 Exterior Dimensions : 14 3/8" x 8 1/4"
Inner Bowl Size : 14 3/8" x 7 7/8"
Exterior Dimensions : 34 5/8" x 19 11/16" x 9 1/4"
Inner Bowl Size : 31 1/8" x 16 3/4" x 8 7/8"
Inner bowl size : 19 3/4" x 16 7/8" x 7 5/8", 10 1/4" x 15 3/8" x 7 1/5"
Overall Size :- 30" x 18" x 9", Bowl Size :- 28" x 16"
A basic need in every modern kitchen. 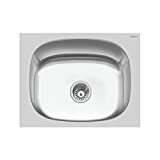 This Sink is easy to use & maintain, Hygienic & resists Stains, Chips & Scratches. It is Perfectly suited for Kitchens with limited space. Material: Stainless Steel, Color: Silver, Finish: Glossy. 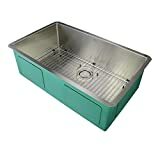 Corrosion And Rust Free,High Durability & 100 % Branded Kitchen Product. 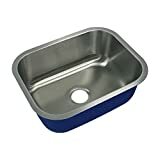 Type: Single Bowl, Size: 41 x 20 x 8 in, 204 Grade Stainless Steel. 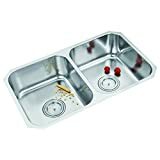 Stainless steel kitchen sink can offer added protection from the everyday wear and tear caused by breaking glassware, scraping cookie sheets and scrubbing heavy pots. 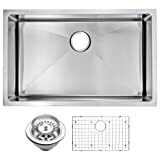 Choke-free strainer, scratch guard to protect during installation, anti-fungal coating in bottom, sound deadening pad in bottom. 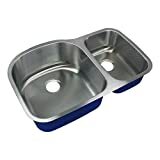 Overall Size :- 37" x 18" x 8", Bowl Size :- 20" x 16" & 14" x 16"
Type: Double Bowl, Size: 54 X 18 X 8 in, 204 Grade Stainless Steel. 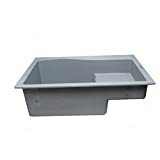 Overall Size :- 31" x 18" x 8", Bowl Size :- 14" x 16"
Overall Size :- 14-1/2" x 13" x 7", Bowl Size :- 12-1/2" x 11"
Exterior Dimensions 33" x 21" Interior Dimensions: 31" x 17.5" Bowl Depth: 10"
Exterior Dimensions: 30" x 20" Interior Dimensions: 27" x 17.5" Bowl Depth: 10"
Kitchen Bath Collection KS-APR22 Farmhouse Double Bowl Kitchen Apron Sink Set with Stainless Steel Sink Colander and Strainer, 33"
For use in a standard 36"(762 mm) cabinet,Three faucet holes.